A combination of education, monitoring and good old-fashioned peer pressure helped eliminate the pest. A lab technician displays Aedes aegypti mosquitoes infected with Wolbachia bacteria in a test tube at the Oswaldo Cruz Foundation (Fiocruz) in Rio de Janeiro, Brazil, on Feb. 19. Brazil has recently ramped up its fight against the Aedes aegypti mosquito, which spreads dengue, Chikungunya and Zika, the latter a virus that has been linked to birth defects. Brazil's health minister Marcelo Castro announced in January that the country would send 200,000 members of the armed forces to help in mosquito eradication, and cities across the country have intensified strategies to combat the pest. But a few communities in Brazil are already leading the way when it comes to eliminating the disease-carrying mosquito from their neighborhoods. One of these is the small town of Água Branca, home to 16,000 people in the state of Piauí. Compared to other similarly sized rural towns in Brazil, Água Branca should have a mosquito problem. But in 2013, when Zika virus wasn't even an issue, the town launched a community initiative to address rising dengue fever rates. The partnership between municipal health authorities and residents focused on eliminating mosquito hotspots, and as a result, Água Branca has reportedly been mosquito-free for three years. Now the state’s governor is taking the program to other towns, where officials hope to replicate Água Branca’s success. Health officials place green stickers on houses deemed free of mosquito larvae; yellow stickers on houses that have no larvae but have cases of water accumulation; and red stickers on houses with larvae. The stickers, which are visible to anyone who passes by, either serve as public incentives for residents to continue setting an example for others, or motivate struggling households to eliminate mosquito breeding grounds on their property. When the community initiative began, health officials conducted awareness campaigns to explain how the sticker system would work, Dóris Leal, Água Branca’s health surveillance coordinator, explained to HuffPost Brazil. Leal credits the partnership between endemic disease control officers and health workers at the Family Health Unit for successfully motivating town residents and making them part of the strategy to protect their own health. Endemic disease control officers, along with doctors from local Family Health units (Brazil’s community-based approach to primary care), traveled to neighborhoods and rural areas in Água Branca, visiting households and going through mosquito control checklists with residents. These professionals pointed out sites where water could accumulate and explained the procedures necessary for combating mosquitoes. At the end of the visit, each household received a sticker based on the level of mosquito eradication it had done (or still needed to do) on the property. The assignment of colored stickers proved a source of inspiration for residents, as well as a factor that motivated change. Those who received green stickers set an example for the rest of the community, and those with a red stamp were motivated to make the extra effort to raise mosquito safety standards. The red stickers also helped health workers keep track of which households were struggling with strategic mosquito control. Mosquito control workers visited red-stickered houses weekly until their mosquito control measures improved. The result has been that in 2015, Água Branca had only seven cases of dengue, and no other mosquito-borne diseases have been reported in the city, according to the Água Branca municipal health department. This number is well below rates of mosquito-borne disease for other Brazilian towns of similar size. Vertentes, Pernambuco, which like Água Branca is in the northeast region of Brazil, has about 20,000 residents and recorded 401 cases of dengue between Jan. 3 to Jan. 16 alone. 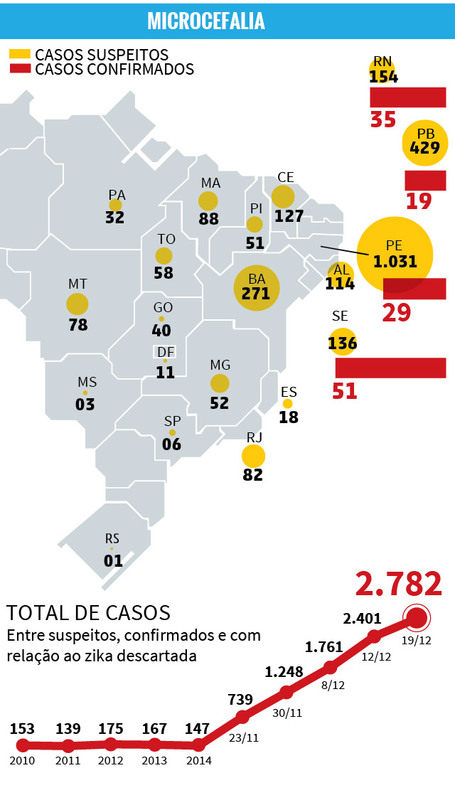 Nioaque, another similarly sized town, is located in Mato Grosso do Sul, a state that actually has a lower number of microcephaly cases linked to Zika virus than Piauí. But Nioaque has about 14,000 residents and recorded 1,524 dengue cases in December 2015. As a whole, the country saw a record 1.6 million cases of dengue fever last year. Omar Akbari, a mosquito control expert at the University of California, Riverside’s Center for Disease Vector Research, isn't surprised that Água Branca has had success at eradicating mosquitoes. He says that the combination of public education, community involvement and public incentives are highly motivating to people who don’t want to be labeled the “bad guys” when it comes to mosquito control. After all, it only takes one house to continue breeding mosquitoes that will plague the rest of the neighborhood. “Stickers make everyone in the neighborhood aware of which houses are breeding mosquitoes and which ones are not,” he said. "It gives you an incentive to make sure you’re not the bad guy in the community." And while the Aedes aegypti mosquito can breed in swampy, wild areas, it is an urban insect that loves to live among people and breed in small amounts of fairly clean, domesticated water. As long as Água Branca residents all continue to agree that mosquito control is important for their community, and the small town is not surrounded by swamps where mosquitoes can breed, Akbari says there’s no reason this method of mosquito control can’t go on working in perpetuity. He did note that the community-based initiative might face obstacles in towns that were both physically larger and in more populous communities. In larger communities, people may be less likely to know each other, which makes public-facing stickers less of an incentive. "In a larger community, this might be more difficult to achieve because it would be hard to get everyone on the same page in terms of mosquito control,” he said. Still, Akbari, who spent his undergraduate summers making mosquito control house calls for Washoe County in Nevada, says there’s no reason not to try these education and public incentive measures in all communities struggling with mosquito-borne diseases. “You’d be surprised at how little people know about mosquitoes,” he said. “Most people don’t even know what’s going on in their backyards, so I think educating the community and providing incentives will go a long way in terms of mosquito control." Água Branca's progress has inspired state leaders to introduce the program to other towns, too. Mosquito control is one of the most important facets of the battle to stop the Zika virus outbreak. If you can put a stop to the insects that are spreading it, you can keep infection rates from rising. So far, an estimated 500,000 to 1.5 million Brazilians have contracted Zika virus from 2015 to 2016, and government health officials have confirmed 583 cases of microcephaly, the birth defect that may be linked to the virus. They are still investigating more than 4,000 cases of microcephaly. Zika virus transmission is ongoing in 34 destinations around the globe, but most of them are in Latin America and the Caribbean.